WARNING! The reader who opens this book expecting to find a somewhat boring dissertation on the intricacies of the metric system will be sorely disappointed. 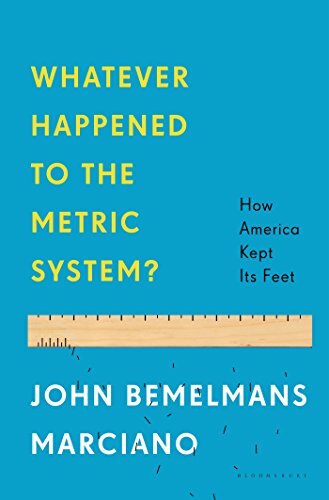 Yes, there is a wealth of detail in the establishment of the metric system and its relationships to other systems of measurement; however, the scientific information is skillfully interwoven with history, politics, and personal egos, showing the intrigues, scheming, and wheeling and dealing that took place in both national and international circles throughout the last three hundred years or so since the metric system was first proposed. Which drink will get you more intoxicated—a pint of Guinness in New York City or a pint of Guinness in London, England? Not really a trick question. The pint in London is about three ounces more than the pint in New York, so you will actually be drinking more beer. Marciano opens his book with interesting facts such as this one to point out the confusion that can come with the use of the English system where various units of measurement are based on different parts of the body. The arm has traditionally been the most common unit of measurement, although the foot and hand have also been used. We can readily see the problem in establishing a uniform length. One NFL study on pro football players showed arm lengths that ranged from 32 and ¼ inches to 36 inches. The decimal played an important and recurring role in the development of both the metric system and money. Marciano describes the discussion that went on after the Revolutionary War when the issue of money came up—there was no standard unit of exchange, just local customs and practices. One fairly common currency was the Spanish dollar or “piece of eight” coin (our present quarter came from the fact that this coin was often cut into pieces for smaller amounts of money). There was interest in adopting the Spanish dollar as is, but Thomas Jefferson proposed that the coin be divided into tenths, hundredths, and thousandths—the first decimal approach to money. In the meantime, things were progressing on the Continent. Jefferson became the U.S. ambassador to France and developed a close relationship with Lafayette (who had been of great help during the Revolutionary War). At that period in history, France was divided into different municipalities, each with its own measurement system (some 250,000 different measurements according to one account). There were rampant abuses in the standards set for measurements and the need for reform became apparent, Unfortunately, the French Revolution came first, and reform fell by the way-side for a while. When Napoleon rose to power, there was renewed interest in the metric system. This interest was shared by Jefferson in the U.S. and by a number of scientists in Europe. One early reform came in the way time was measured. Other changes came by way of efforts to unify the system of measurements in America. The French politician Talleyrand took the lead in development of the metric system in France and argued that it should be the universal system throughout the world. The discussion quickly evolved into a political controversy brought on (at least in part) by the financial difficulties the country of France found itself in as a result of the French Revolution. What should have been a strictly scientific debate rapidly was caught up in issues of money, political intrigue, and national honor. The preceding paragraphs give a picture of the flavor of this thoroughly enjoyable book. Interwoven with the science are discussions of personalities and characters (one politician is described as a “rake,”, an obvious commentary on his low moral character). National and international politics, treaties, wars—all play a role in seeing the full picture of the development of a system of measurements used by the vast majority of the world’s countries. Marciano knits these seemingly disparate threads into a rich narrative.